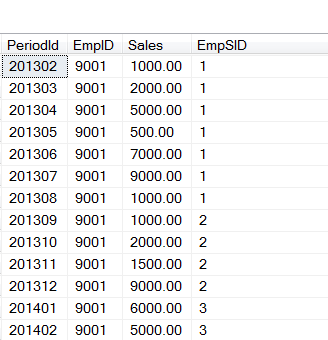 This is a simple example of SCD (Type-2) in OLAP cube. We have a Dimension table for Employee and their Departments. This dimension is an SCD. One employee worked in different department over the course of time. EmpID is business key and SID is surrogate key. We have another dimension called DimTime. It’s a very simple Month Dimension table. Both business key (EmpID) and Surrogate key (EmpSID) is present in Fact table, but we will use only EmpSID key here. See carefully that I did not use SID in hierarchy. I used employee name (attribute called ‘Employee’) for reporting purpose. Its key column and name column both are set to Employee column of the physical dimension table. You can clearly see that an employee named David sold different amounts in different months. David sold under Product Development Department for up to Aug-2013 and then he started selling under Android Apps department from Sep-2013. This entry was posted in MDX, SSAS (Analysis Service), Cube and tagged dimension, Dimension table, OLAP cube, scd, scd hierarchy, slowly changing, slowly changing hierarchy, type-2. Bookmark the permalink.